While Warner Bros builds its MonsterVerse with Godzilla and King Kong, Universal Studios has its own upcoming monsters universe, featuring Russell Crowe as Dr. Jekyll, Javier Bardem as Frankenstein’s monster, and Johnny Depp as The Invisible Man. The first of those – arriving on June 9 – will be Tom Cruise-starrer The Mummy, which got a new trailer last weekend. In an interview with The Hollywood Reporter on Monday, Sigourney Weaver revealed that Avatar 2 will begin shooting in autumn. “We’re starting training, and we’re starting — hmm, I probably can’t say anything. We will be actually shooting it by the fall,” she added. On Tuesday, Netflix released a new teaser for its superhero mash-up mini-series Marvel’s The Defenders. It doesn’t show you much, honestly, but it did provide one important nugget of information – the release date. The show will hit Netflix on August 18. An upcoming documentary, I Am Heath Ledger, will explore the life of the eponymous The Dark Knight star, who tragically died before the film’s release. The role got him a posthumous Oscar, and has set the standard for villain performances. Spike TV released the first trailer for the film this week, which includes footage captured by the actor, and interviews with his friends and colleagues. We know a Dune reboot is on the way from French-Canadian director Denis Villeneuve, and the film now has a writer. Variety reported on Wednesday that Legendary Entertainment, the studio, has brought on board Forrest Gump screenplay writer Eric Roth to script it. If you’ve been getting tired of cinematic universes, you’re not going to like this. Activision Blizzard wants to rival Disney’s MCU with its own, by getting Call of Duty on the big screen. Video game adaptations haven’t ever been fruitful, so it’ll be interesting to see what Activision has in mind. Lately, comedian-actor Louis CK has been focusing his efforts more towards fiction – just last year, he was involved in Horace and Pete, Baskets, and Better Things on TV, along with voicing a character in The Secret Life of Pets. With 2017, Louis returns to the art form of stand-up comedy specials, something he hasn’t explored since 2015’s Live at the Comedy Store, which bypassed the system in their release format. From there, he delves into the taboo around talking about suicide, the pettiness with wanting our dead relatives to “look down on us” from heaven, why love is great – but you shouldn’t expect it to last, and the many problems with raising children. He even talks about his love for the film Magic Mike, and why he’s never watched the film in its entirety. To describe FX’s adult spy animated sitcom to a newcomer, it’s best to borrow creator Adam Reed’s words: it’s like James Bond meets Arrested Development. For seven zany seasons, the show has followed a bunch of obnoxious misfits – the eponymous spy lead, Sterling Archer, who only thinks about himself; colleague Lana Kane, who’s as capable (or possibly more so) as Archer, but is left frustrated because Archer’s mother Malory runs the agency. The cast also includes comptroller Cyril, Malory’s secretary Cheryl, HR director Pam, R&D head Krieger, among others, all of whom have their own quirks and idiosyncrasies. Reed plans for the show to last another three seasons, which are all going to twist the show’s formula, like season 5 (Archer Vice) and season 7 (inspired by Magnum P.I.). If you aren’t caught up with the show, stop reading now. [Spoiler alert] The eighth season, that began earlier this week, does just that. 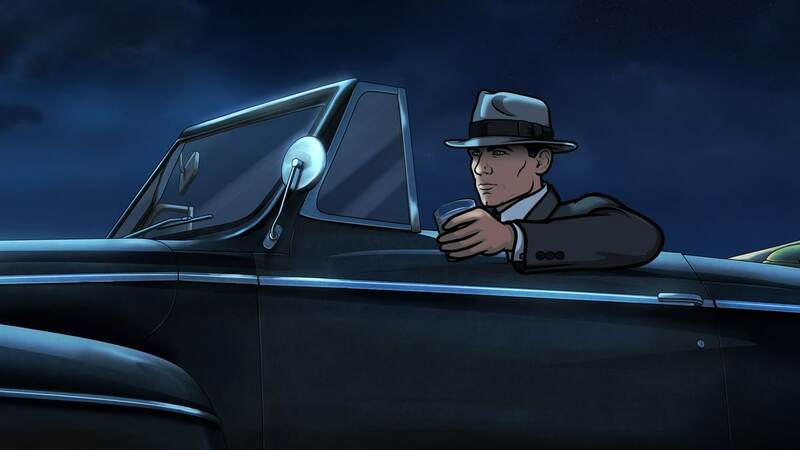 With Archer in a coma, the eight-episode season will take place in his dream-world – hence called Archer: Dreamland – and will be set in 1947 Los Angeles, for that classic noir feel. When Disney acquired Lucasfilm in 2012, it said that apart from making sequels in Episode VII, VIII and IX, it would also be looking at standalone spin-off films. The first of those – Rogue One – arrived late last year. The film is set immediately prior to the events of 1977’s Star Wars, now known as Episode IV: A New Hope. It tracks a ragtag outfit of Rebel spies, mentioned in the original film’s opening crawl, as they set about trying to find the plans to the Death Star. Making up this outfit and the film’s principal cast are Jyn Erso (Felicity Jones), Cassian Andor (Diego Luna), droid K-2SO (Alan Tudyk), Chirrut Îmwe (Donnie Yen), Baze Malbus (Jiang Wen), and Bodhi Rook (Riz Ahmed). On the opposite front, there’s Imperial baddie Orson Crennic (Ben Mendelsohn). Franchise favourite Darth Vader, and Clone Wars veteran Saw Gerrera (Forest Whittaker) make cameo appearances. It’s far from a great film – the first half can be dragging – but the action sequences, especially the one with Vader in the end, satisfied fans. If you get the Blu-ray, you’ll featurettes on the cast, and the digitally recreated characters, along with a making of the film. The film’s name comes from both its lead character and where he lives – Paterson (Adam Driver) is a bus driver in the city of Paterson, New Jersey. He has a simple routine: drive the daily route, observe the city from the windshield, and catch fragments of conversation that go about him. Post-work, he walks his dog, writes poetry, has exactly one beer at a bar, and goes home to his wife, Laura (Golshifteh Farahani). Laura’s world is full of ambition – she dreams of being a country singer, and opening a cupcake business. The two support each other in what they want from life, and the film is a quiet observation of their wins and losses, supported by the poetry. Paterson’s life may be simple, but it’s fulfilling for him, and his wife. From acclaimed writer-director Jim Jarmusch, Paterson was deemed a critical hit after its premiere at Cannes Film Festival last year, and became one of the best reviewed films from 2016. On its surface, the latest chapter in the Persona franchise seems to about urban high school life. But there are some mysterious on-goings, involving a bunch of teenagers with alter egos. In many ways, Persona 5 is a coming-of-age story, as it follows a quiet and well-mannered second-year student who just moved to Tokyo before school began. Except his hidden side, i.e. the persona, is the complete opposite. Along the way – you can spend close to 100 hours and still not get tired of it – you will encounter several individuals with their own personalities and surprises. Since it’s a Japanese role-playing game (JRPG), it will be quite different for people used to playing more action-oriented Western RPGs. Persona 5 got the highest-possible score in our review of the game, as we loved the striking presentation, its infectious background music, and addictive combat to go with the exceptional story. If you’re still not convinced, we also discussed it in-depth on our weekly gaming/pop culture podcast, Transition. A side-scrolling shoot ‘em up, developer Vertex Pop’s Graceful Explosion Machine gives you the keys to a fighter ship armed with “a ludicrously overpowered quad-weapon array”, and throws you into deep space. Your survival skills will be tested as you make your way through “jewel-hued alien worlds” and come up against “crystalline enemies”. Thankfully, you’ve got the GEM fighter to find your way home, which claims to be the most advanced single pilot fighter in the galaxy. Guess Darth Vader in a TIE fighter doesn’t count? Anyhow, if you’re looking for a fast-paced arcade shooter for your new Nintendo Switch, critics seem to think this is an appropriate choice. It’s got striking visuals to boot, and in combination with the fine-tuned gameplay, Graceful Explosion Machine will be a memorable experience. Sure, it’s got some repetitiveness that comes with any shoot ‘em up title, but you can bear those, right? You get only 30 levels spread across four worlds, so it’s all about retrying until you’ve mastered them.